During the eighteenth century the French Society was divided into three groups. These groups were called estates. The three types of groups were - First estate, Second estate and Third estate. First Estate: Clergy belonged to 1st estate of then French Society. Clergy were the group of persons who were invested with special functions in the church,e.g. fathers, and other members of church. Second Estate: Nobility belonged to 2nd estate of then French Society. Nobility was hereditary and hence a person could get nobility by birth. However, new members were also awarded nobility by monarchy after paying heavy taxes or outstanding service to the monarchy, i.e. nobility could be purchased also. 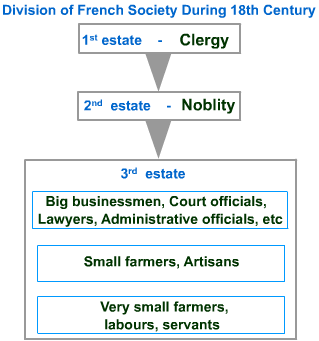 Third Estate: The 3rd estate of then French society was further divided into three categories. Big businessmen, merchants, court officials, lawyers, etc. belonged to the first category of 3rd estate. Peasants and artisans belonged to the second category. And small peasants, landless labours and servants belonged to third category, and were considered as the lowest class in the society. Members of the third state had to pay all types of taxes including tithes and taille. Clergy and Nobility were privileged class. They had certain special privileges; in addition to feudal privilege. They were exempted from paying any types of taxes. They paid feudal taxes extracted after the members of the third estate. Tithes: A type of tax collected by churches which was collected from peasants in the eighteenth century French Society. Taille: A type of direct and indirect tax which was paid to the state by members of third estate in French Society in the eighteenth century. Taille was levied on items used for daily consumption, such as tobacco, salt, etc. Livre: Unit of currency of France. This was discontinued in 1794. Louis XVI, who belonged to Bourbon family of kings, became the ruler of France in 1774. By that time; long years of war, maintenance of the court of the immense palace of Versailles made the treasury empty. In addition to this; helping during the war to the thirteen American colonies to gain their independence from Britain by Louis XVI raised the debt of treasury to more than 2 billion livers. Lenders to the state also started charging 10 percent of interest on credit to the state; this further worsened the situation of the society. Thus, in order to maintain those expenses, state was forced to increase taxes which increased the anger among the members of the third estate. On the whole, members belonging to third estate were oppressed class and had to bear all the burden of all types of taxes. Increase of population from 23 million in 1715 to 28 million in 1789, increased the demand of food grains. Poor production of food grains, frequent draught or hail, diseases, epidemics, further worsened the situation. This resulted in increase in the price of bread which was staple diet of majority. Wages of worker did not keep the pace with price rise. This increased the gap between poor and rich. These things led to subsistence crisis for the majority as poor were not able to meet the required price to purchase even bread. In the eighteenth century, many persons who belonged to third estate and earned their wealth through overseas trade and manufacturing goods, were termed as middle class. It was a new social group, which also comprised of court officials, lawyers and administrative officials. Peasants, labours, had been participating in revolts against increase in taxes and food scarcity for long time, but because of lack of means and concrete programmes they did not bring any change to the society. Thus bringing the change about the social and economic order in the society was left to the middle class. People of the middle class were also oppressed at that time, as they had to pay taxes and meet the demands of clergy and nobility. People of Middle class were educated and believed that no privilege should be given by birth, rather position of a person in society should be merit based. Philosophers, such as John Locke and Jean Jacques Rousseau were envisaging a society based on freedom, equal laws and opportunity for all. The freedom of thirteen colonies in USA from Britain based on such ideas; strengthened the thoughts of then philosophers who mainly belonged to middle class. The ideas of guarantee of individual rights became one of the important examples among the political thinkers and then philosophers of France. Refuting the doctrine of divine and absolute right of the monarch was the main idea of Locke which was made public in his Two Treaties of Government. Rousseau proposed the idea to form a government based on a social contract between people and their representatives. Montesquieu gave the idea of division of power within the government among the legislative, the executive and the judiciary in his The Spirit of the Laws. These ideas of then philosophers and political thinkers began to spread far and wide among people. People started discussions to bring the change in society as well as government based on those ideas. Such discussions began to take place in salons, coffee house, etc. Many books were published based on those new ideas. Some persons used to read those books and newspaper aloud among people at public places so that those who could not write or read could also become aware of them. Spreading of ideas of freedom and news of further plans of Louis XVI to increase the rate of taxes and imposition of some other new taxes increased the anger among people. This resulted protest against the government, its system and privileged class in the form of revolt.